UCLA Henry Samueli School of Engineering is one of the top-ranked schools in the world. This is a product of a diverse student population, a talented faculty whose members have won multiple awards, honors, and distinctions, dynamic and interdisciplinary undergraduate and graduate programs, and our omnipresent, constant drive to find solutions to challenges in fields including energy, sustainability, healthcare, communications, transportation, infrastructure and information technology. Together, the students and faculty members are making a world of difference. At UCLA, companies are guaranteed to recruit from some of the brightest undergraduate and graduate Civil & Environmental Engineering students in the nation. There are many reasons why UCLA Civil and Environmental Engineering consistently produces top engineers with strong technical backgrounds and leadership experience. It begins with the multitude of student engineering associations including our very own American Society of Civil Engineers (ASCE), California Geotechnical Engineering Association (CalGeo), Institute of Transportation Engineering (ITE), Engineers Without Borders (EWB), Chi Epsilon, and Tau Beta Pi. Along with classroom lectures and labs, these organizations and honor societies help enrich the students' educational experiences through active collaboration in hands-on project and research. They also provide opportunities for students to communicate with many industry members through workshops, field trips, and social events. All of these student-run organizations truly cultivate a vibrant, social environment for students where they can learn from each other and freely share their experiences, stories and occasionally, good puns! Trust us, you do not want to miss the moment! Career Fair student attendee impressing the company representative. 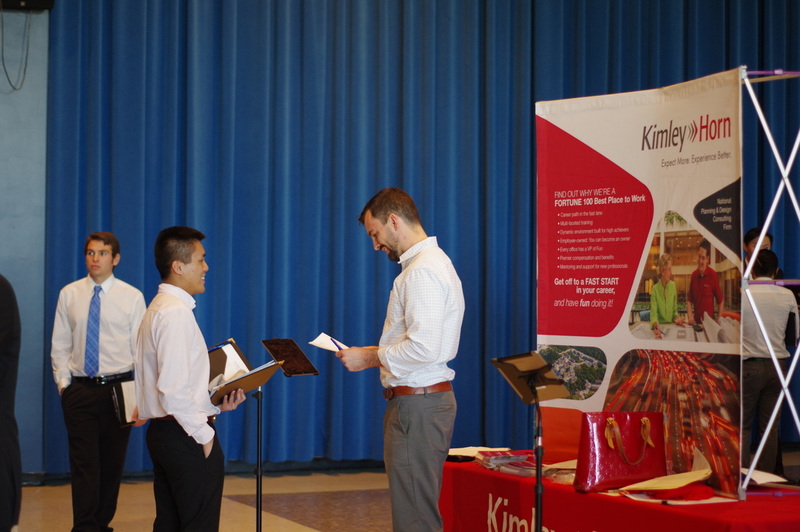 We host two Civil and Environmental Engineering Career Fairs every year. Unlike the general career fairs where all sorts of companies show up, these two career fairs specifically bring companies from the civil, environmental, geotechnical, hydrologic, structural, and transportation engineering and construction management industries. The tone is very professional and the talent is top-notch. They are great opportunities for students to establish professional relationships with employers and to show off their talents and résumés. Last time, our career fair attracted more than 200 undergraduate, graduate and post-graduate students. Over the years, the size of our career fairs has expanded tremendously. To accommodate this size, we host both Fall and Winter Civil and Environmental Engineering Career Fairs in Ackerman Grand Ballroom on the UCLA Campus. This academic year, Fall Career Fair took place on November 1, 2018, and Winter Career Fair will take place on January 31st, 2019. Below is a list of companies who will attend the 2019 Winter Career Fair on January 31st, 2019. Click on a company to go to its website and learn more about its career opportunities. Students who would like to attend must be paying members! Check your membership status here. Our Civil and Environmental Engineering Career Fairs give recruiters access to hundreds of top civil engineering students at UCLA. Registration includes admission to the career fair for two company representatives, one booth reservation, one parking pass, refreshments and lunch for each representative, and a company overview in our career fair packet. We also have a Winter Networking Night, held before the Winter Career Fair. This event allows recruiters to interact with our school's top engineering students in a more casual setting. Click here to register and learn more about the various options for registration and sponsorship. If you want to participate in the Career Fairs to recruit for full-time, part-time, and internship opportunities, please complete our 2018-2019 Career Fair Registration Form and contact our Career Fair and Speaker Coordinators.